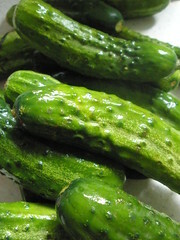 Taught the girls how to make homemade pickles today. These are refrigerator pickles, but I thought we’d use some of the canning jars we had on hand. Visited the farmer’s market in Minneapolis earlier in the week and found everything we needed: pickling cucumbers, onions, garlic, and fresh dill. 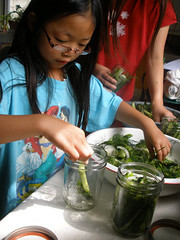 At home, we had vinegar and canning salt. 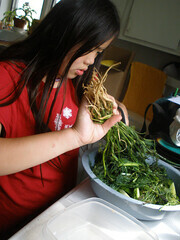 After cutting the cucumbers into quarters, the girls cut dill into small sections. I sliced the onions and peeled the garlic. 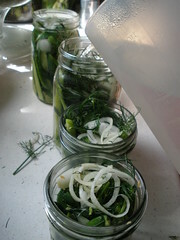 Into each jar they placed the cucumber slices, onions, dill, and garlic. Each had a batch of vinegar and canning salt boiling on the stove. When the vinegar solution boiled, they poured it into the jars. I put the lids and bands on; and the pickles were ready 24 hours later.